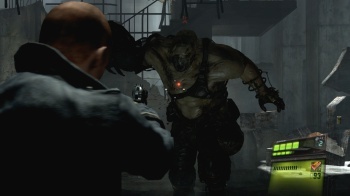 Resident Evil 6 will have four times the talking of its predecessors. According to the British Board of Film Classification, Resident Evil 6 has precisely 4 hours and 15 minutes of cutscenes. It also features, rather unsurprisingly, "strong violence and gore," earning it an "18" rating, the equivalent of a "Mature" rating in NA. For comparison, Resident Evils 5 and 4 clocked up about an hour of non-interactive talky-time each, and I'm fairly certain it's possible to complete the original Resident Evil in less than four hours. The four hour figure is made less daunting, however, by news that it'll be spread across a fairly substantial campaign. Each of the game's three separate campaigns are only slightly shorter than the single storyline featured in Resident Evil 5. Each of the three campaigns focuses on a different two-person team; Leon S. Kennedy and Helena Harper; Chris Redfield and Piers Nivans; and Jake Muller and former sailor suit-clad dead weight, Sherry Birkin. Once those campaigns are finished, a fourth, featuring an as of yet unnamed protagonist, will be unlocked. Personally, I'm hoping for Carlos Oliveira, who basically fell out of the franchise's continuity following his part in Resident Evil 3: Nemesis. Resident Evil 6 is scheduled for release on October 2nd for Xbox 360 and PS3. There's no date for the PC release just yet.